Today we can celebrate the memory of Patrick Leigh Fermor, whether we attend his memorial service in London, or are just able to take a moment to reflect on all he gave to his family, his many friends, to us his admiring readers, and of course his service to his country and to Greece. I thought the best way to mark this day on the blog is to feature this fine photograph sent to me by John Chapman. It is from Ian Collin’s book about the life and work of John Craxton, the artist who illustrated most of Paddy’s book covers. Craxton designed the sets for Daphnis & Chloe at the Royal Opera House in 1951 where the lead ballerina at the time was Margot Fonteyn. According to rumour they had an affair, and in the summer of 1951 they cruised together around the Meditterranean. 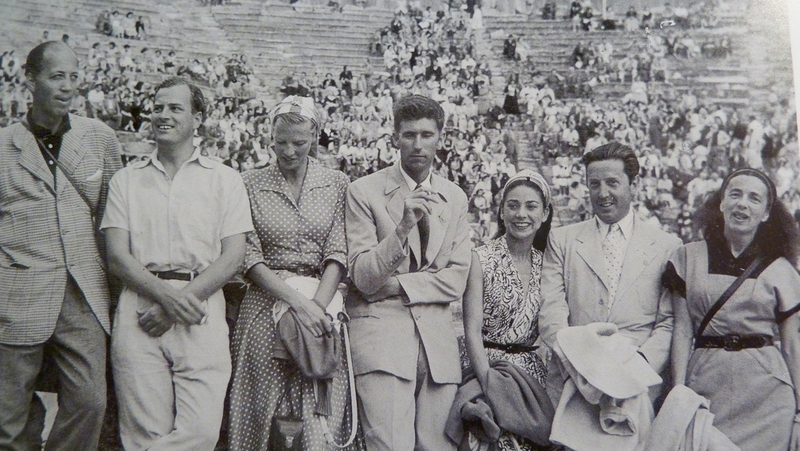 Paddy was their guide to Greece, and it was at this time that this delightful photograph was taken which shows Paddy looking very happy, with good friends, and his much loved Joan. The photograph shows Tom Fisher (a New York attorney and husband of Ruth Page) Paddy, Joan, John Craxton, Margot Fonteyn, Frederick Ashton and Ruth Page (choreographer). It was taken in the theatre at Epidavros, and is attributed to Costas Achillopoulos. This entry was posted in Paddy's Death, Paddy's Friends and tagged ballet, Daphnis and Chloe, Epidavros, Frederick Ashton, Joan Eyres Monsell, Joan Leigh Fermor, John Craxton, Margot Fonteyn, Patrick Leigh Fermor on December 15, 2011 by proverbs6to10. A memorable day – for countless reasons. Please may we have the full Order of Service posted here – if poss – especially for those of us at huge distance and / or otherwise engaged yesterday 15 December ? I am truly sorry not to have been able to attend and look forward to reading of the Service and tributes paid to our hero and, of course, The Greatest Living Englishmen of his day ! Richard – it is online now! Small correction Tom, Ruth Page was the choreographer, her husband, Tom Fisher, was an attorney. The service today was delightful and if Paddy had been there it would have probably gone on for another hour with further verses of Widdecombe Fair in more languages. John – it was so busy. It would have been good to have said hello. It was a marvellous service. I disagree; probably two hours if we had the full Mioritza! Small corrections made.